You've got all those "first tier" tools--hammer, screwdriver, tape measure, etc. You've loaded up on "second tier" tools--cordless drill, cordless Sawzall, etc. Now it's time for the "third tier." That's what I call it, anyway: tools that are super-cool to have, but not essential. The wet tile saw is one. Cordless paint sprayer. And now, the twin blade saw. I began this piece as a critique of the RIDGID 5 inch TwinBlade, sent to me by RIDGID for review. Then I realized that I had little else to compare with the RIDGID since it was my first experience with a twin blade saw. So, look at this as a primer on twin blade saws, featuring a DIY-friendly saw found at The Home Depot for about $149.00. What Is a Twin Blade Saw? Twin blade saws are just like your typical circular saws, except for one thing: two blades instead of one. Not only that, the two blades rotate in opposite directions. Sounds crazy, but there is a method to this madness. Because these blades rotate in opposite directions, the saw has no mind of its own. This is in sharp contrast to single-blade circular saws, which always seem to be propelling you in one direction or another. A twin blade saw is all about control. Cut forward, cut backward, cut up, or cut down--it's your choice. Kickback is not entirely eliminated but it is reduced. Additionally, a twin blade saw delivers a cleaner, sharper cut than single-blade saws, even when fitted with toothy blades. What Do You Use a Twin Blade Saw For? Plunge cuts. This means sticking the rotating blade straight into that board--something you cannot do with a single-blade saw. Or which you can do with a single-blade saw but with great danger and little control. Twin blade saws let you drop the saw down exactly where you want it and with perfect control. Cutting fine material. You can cut laminate or veneer with a twin blade saw and get clean cuts. Cut metal without changing blades. 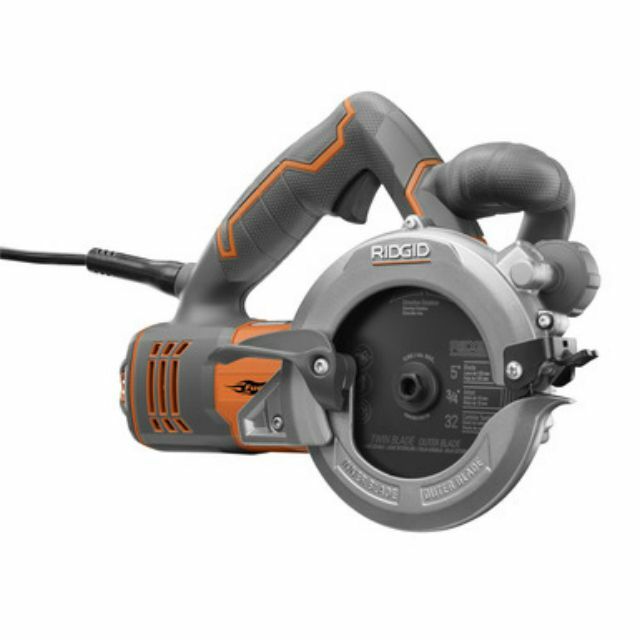 How Did the RIDGID 5 Inch TwinBlade Saw Do? I decided to put the RIDGID right to the test by cutting up orphaned lumber that was cluttering up my parking area. The RIDGID assembled quickly--fifteen minutes from opening box to plugging it in. I was able to quickly cut these 5" wide boards with straight plunge cuts. The 10 amp motor ensured that the saw did not falter. Then I began cutting Formica. Even though I was using ripping blades, they still produced admirably clean cuts. Imagine how good the cuts would look with finish blades! The RIDGID TwinBlade balanced well in my hand, and I never felt tired. No doubt you can buy more expensive twin blade saws--but why would you? My theory is that you should go inexpensive when buying these "third-tier" tools. You won't use them often enough to justify shelling out many hundreds of dollars for contractor-quality tools. In that light, the RIDGID 5 inch TwinBlade is just the ticket.